HomeWater Protectors Ask You To Call Gov. Dayton to Stop Line 3! Anishinaabe drummers encouraged and supported the water protectors. I don’t usually put a byline on this blog, but felt it was important in this case because I was more than an observer; I was one of those cited for disorderly conduct. I co-chair the Beyond Oil and Tar Sands Committee of the Sierra Club’s North Star Chapter and have been volunteering to stop Line 3 for the past two years. Top Sierra Club leadership participated in the Bemidji action, and this was a significant step for the organization. Historically, it has not participated in non-violent direct action. There were only two exceptions, both in Washington D.C. This was the first act of non-violent direct action in which the Sierra Club has participated in outside of the capitol. Enbridge’s Line 3 pipeline poses an unacceptable risk to Minnesota communities and our climate. I’m here today to represent millions of Sierra Club members and supporters in standing with our indigenous allies and sending a clear message to Governor Mark Dayton: stop this dirty tar sands pipeline. So we are escalating our call to action to stop this project. This is not a decision I took lightly. … Civil disobedience has a long and dignified history of helping people speak truth to power. At this critical moment, I feel a great obligation and responsibility to do everything in my power to stand with allies, and fight for the clean energy future that we know is possible. The Sierra Club media release includes a number of statements by participants. Others included Winona LaDuke, executive director of Honor the Earth and Tom Goldtooth of the Indigenous Environmental Network. 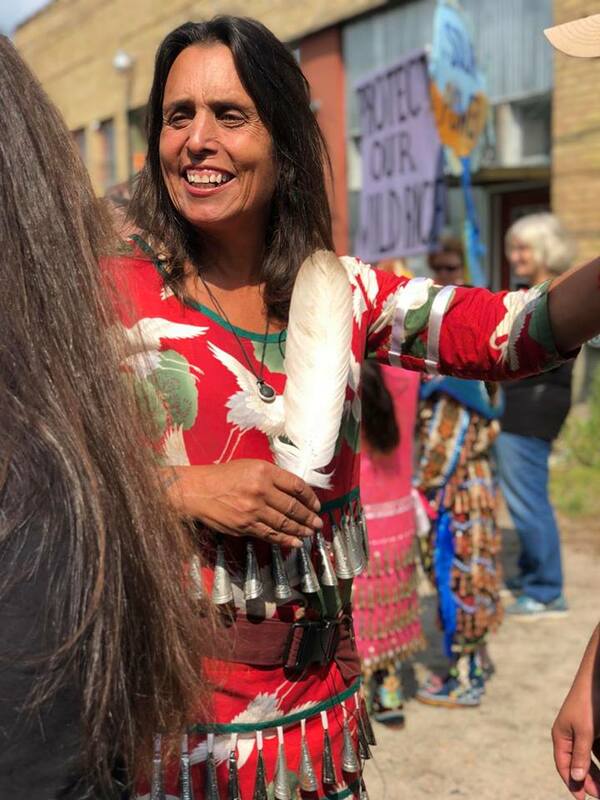 Tribal governments and Minnesotans are telling Minnesota Governor Mark Dayton to take immediate action through Executive Order to halt all permits and any pre-construction of the proposed Enbridge Line 3 pipeline until legal appeals are heard, until the courts have fully weighed in, and the Minnesota Tribes have conducted … assessment and inventory of significant cultural and historical properties and sacred sites. Call Dayton now and have your voice heard. Youth Climate Intervenors Akilah Sanders-Reed and Isabel Watson. MPR: Bemidji Line 3 pipeline protest indicates renewed opposition after regulatory approval. 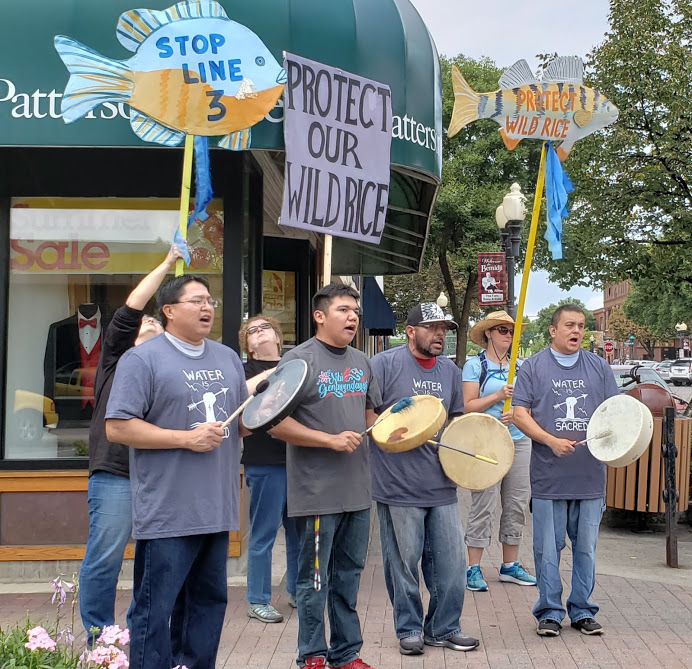 The Bemidji Pioneer: UPDATED: Line 3 protesters hold rally, block streets in downtown Bemidji.